This all-star Lemon Meringue Cookie recipe dresses up any occasion and will make you look like an expert cookie maker. 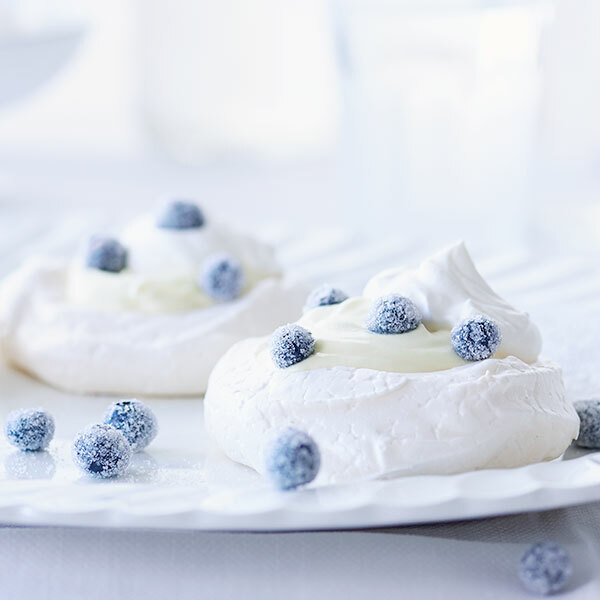 These Lemon Meringue Cookies feature soft folds of white meringue with creamy lemon custard filling and have just the right amount of sugared blueberries delicately resting on top. Even the most regal cookie lovers will be impressed. Preheat oven to 250°F. Line a sheet pan with parchment paper. Using a 4-inch-round biscuit cutter, trace 6 circles onto parchment for shaping meringue. In the bowl of an electric mixer, beat egg whites with cream of tarter until soft peaks form. Slowly add sugar, beating well after each addition. When stiff and glossy peaks form, beat in vanilla. Using a large spoon, divide meringues between parchment circles and form nest-like shapes with meringue. Bake for 45 minutes. Turn off oven and leave meringues in oven for another 45 minutes. Place prepared lemon curd in a large bowl. In the bowl of an electric mixer fitted with a whisk attachment, beat whipping cream until soft peaks form. In two batches, fold in whipped cream to the lemon curd until just incorporated. Refrigerate until ready to use. Create an assembly line by lining up blueberries, egg white and sugar. Working with several berries at a time, dip berries in egg white and then roll in sugar. Fill each meringue with about ⅓ cup lemon custard. Sprinkle with sugared blueberries and serve.